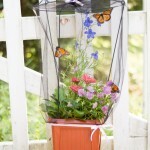 Plants are carefully selected to create a beautiful mini garden with TTlive butterflies. A special perennial is included and can be planted outdoors to continue to attract butterflies year after year. 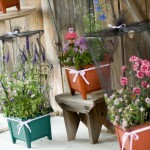 Fresh cut flowers are beautifully arranged inside a charming outdoor lantern. 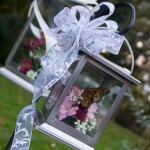 Each lantern arrangement comes complete with live Painted Lady and/or Monarch Butterflies. The lantern is then adorned with a lovely matching bow to top off the gorgeous display. A beautiful arrangement of fresh cut flowers in a basket featuring painted lady, monarch, swallowtail or mourning cloak butterflies. Send a Butterfly Bouquet as your next Sympathy Arrangement: The family can release the butterflies at a graveside service in memory of their loved one. Serving Lawrence, Mercer, Butler, Beaver counties in PA and Mahoning County OH.